How are my managers really doing? 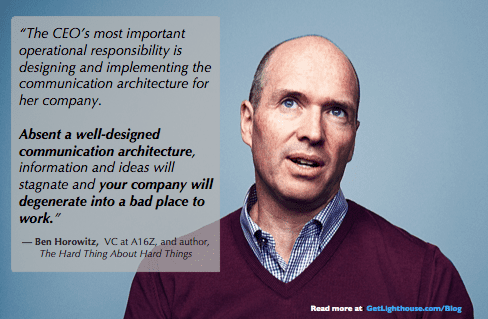 What’s really happening in my organization? What do my people really think? Whether you’re a veteran leader, or brand new to having real hierarchy below you, these kinds of questions are likely to be on your mind quite often. The more removed from the day-to-day work you are, the harder it is to have a feel for what’s happening and how people are really doing. The skip level 1 on 1 meeting is one of the best ways to keep a pulse on things, and gather insights you could not get any other way. Are skip level meetings a good fit for you? How do you start skip level meetings? How do you make the most of your skip level 1 on 1s? First, as an individual contributor, your job is to do your work to the best of your ability to help the team and company. Then, as a manager, your job is to get the best performance from your team. You’re now a multiplier. When you manage other managers, you need to develop leaders under you, and look out for the macro behaviors & culture across your department. Your efforts are now exponential. You were an okay manager, are you ready to teach others how to be a good manager? You don’t know everything that’s happening all the time anymore. Can you make good decisions with partial information? The demands on your time (and meeting requests) have never been higher. Are you investing your time wisely for the short and long term? Dozens, or maybe even hundreds, of people are looking up to you. Are you setting a good example? It can certainly feel daunting. The can-do, take-on-any-project attitude that may have made you a great individual contributor is impossible at this level. You have to be careful with your time, and deliberate in your approaches. How do you spend your time as a leader? Find out how your managers are really doing beyond what they tell you. 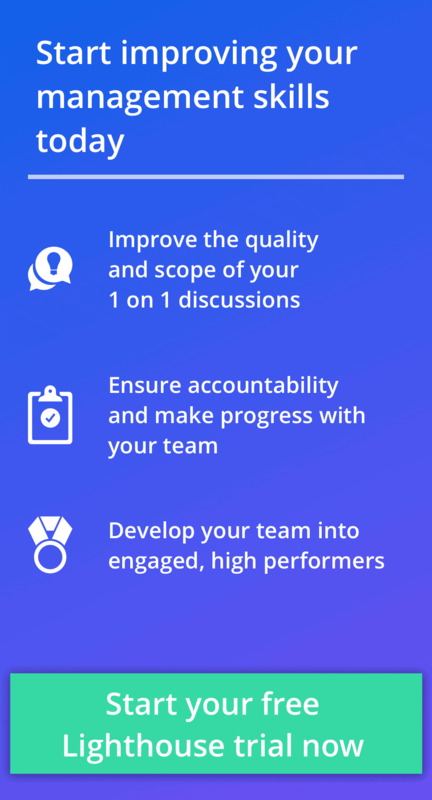 Get feedback and insights to help your managers, and their teams, improve. Get a pulse on what’s happening on the front lines you’re layers removed from. 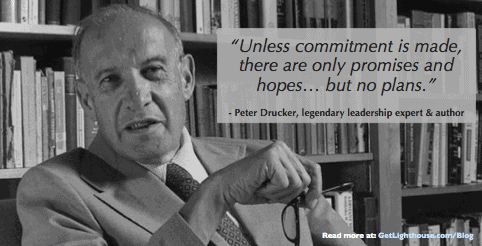 Build trust with those lower in your organization so they stay engaged and contributing. Learn where there is dysfunction, insufficient communication, or confusion within parts of your organization. Personally demonstrate you value everyone in your organization in a scalable way. With just a few hours of your time each week, you can get insights from people you rarely get to interact with otherwise. Even better, when you consider the sum of everything you hear, patterns will emerge that help you understand more of what’s happening across teams and your organization as a whole. This helps you make better decisions, catch problems with a manager before it leads to turnover, and strengthen relationships with everyone in your organization. With all these potential benefits for you to be an effective leader, it’s no surprise those that have them swear by them. 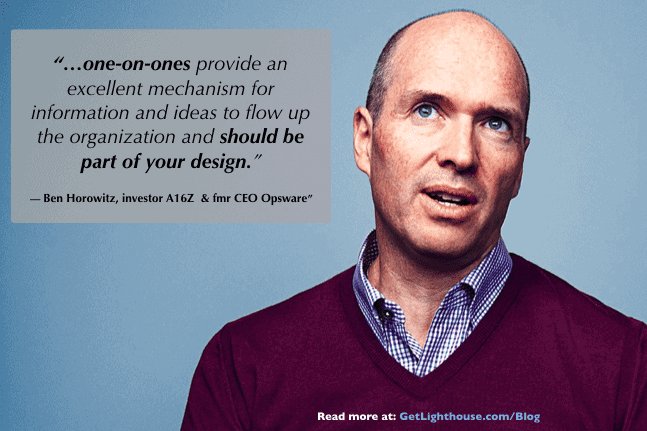 So you’re bought into the idea of having these meetings, but how do you start them? Tell your managers – to avoid surprises or concerns about what will be a net positive for them. Tell your skip level team members – so they know why you are meeting with them and what to expect. Schedule them in a manageable way – there’s still only 24 hours in a day, so you need to be deliberate in scheduling them at the right frequency, and not miss anyone. If you just started having skip level meetings without telling your managers, they’d probably wonder what was going on. Don’t do that. Instead, explain to them why you’re doing them and address any of their concerns. If you have a 1 on 1 with them soon, talking about it there is a great way to have time to answer their questions. It also has the bonus of allowing you to convey your genuine, positive body language as you share your goals of doing them. It would be easy for a manager to feel undermined by skip level meetings if they thought it was just to check up on them. That’s why you need to frame it as a net positive and clearly state your true intentions. I wanted to let you know I’m starting something new. Occasionally, I will do skip-level 1 on 1 meetings with your team members to get a pulse on strategy, build relationships, and understand your team members’ perspectives. From these conversations, you may hear new feedback or questions from your team members. That’s healthy and to be expected. I’ll also share any patterns or common feedback I hear that’s relevant to you. With the right expectations set, and a little trust from your managers, they’ll buy into what you’re doing. If you haven’t built a relationship with many of your skip level team members, they may be surprised or concerned about you wanting to meet with them. They may wonder if they’re in trouble, or did something wrong. I’m starting something called skip level 1 on 1s with you and your peers. It’s a chance for us to meet, get to know each other, and talk about what’s working and not in our organization. The goal is to help us all work better together, and ensure you’re happy and successful working here. I’ll bring a few questions for you, and if there’s anything you’d really like to discuss, we’ll start with that. Ideas for improving your team, observations you think I should know about, and feedback on your manager are all good topics. I’m also happy to answer any questions you have for me. When you set expectations, it removes the risk of people having the wrong idea coming into them. Then, you’re much more likely to start the first skip level 1 on 1 meeting off on the right foot with everyone. 3) Schedule them in a manageable way. The challenge with any plans for skip level 1 on 1s is how quickly the number of meetings you need to have can grow. It’s easy to suddenly realize you have 20, 30, 60, even 100 people you could meet with. Make regular time: Take a look at your calendar and ask yourself how many hours a week you can devote to these. Divide by your number of skip levels: Divide the number of skip level team members you have by your number of hours you’ve committed to in step 1. This is how many weeks it will take to get to everyone before starting the cycle again. Example: With 60 skip level team members, it would take 20 weeks to meet with everyone once. Start scheduling recurring meetings: Get them on your calendar so the time doesn’t get filled with other commitments, and so that you & your skip level team members can prepare. By making the weekly commitment, you can slowly chip away at even large teams, and build a healthy rhythm. While they meetings will be with different people each week, you’ll get used to having them as part of your work week. This is the key to making skip level meetings a successful habit for you. Yes. With a little planning and a commitment to meeting, you can keep in touch with even large teams. Most leaders we’ve spoken to meet with their teams of 40-50 people quarterly. At companies like Netflix, some leaders even manage to have skip levels annually with over 300 reports. If you’ve recently risen to the rank of managing managers, you may not have that many skip level reports. When there’s only a dozen or so of them, it can be tempting to meet with them almost as often as your weekly 1 on 1s with your team. However, you need to avoid having them that often. They’re a great tool, but the primary means of communication should be Individual Contributor (IC) -> Manager -> You. Your skip level meetings skip that middle step. This is why one of the key things to ask in a skip level meeting is, “Have you talked to your manager about this?” to reinforce and encourage good communication between IC and manager. You can have too much of a good thing in this case. If you rely on skip level meetings too much, you’re sending mixed signals to the manager of that team. Of course your skip level team members wants to speak to you. Of course they are going to share the most relevant interesting bits because you are The Boss. Too much skip leveling can ultimately degrade confidence in what should be the primary means of communication: IC -> Manager -> You. If you tell your managers and team members what to expect, and make it a habit to have some every week, you’ll be well on your way to great skip level meetings. Now, let’s look at how to make the most of them once you’re in the meeting. 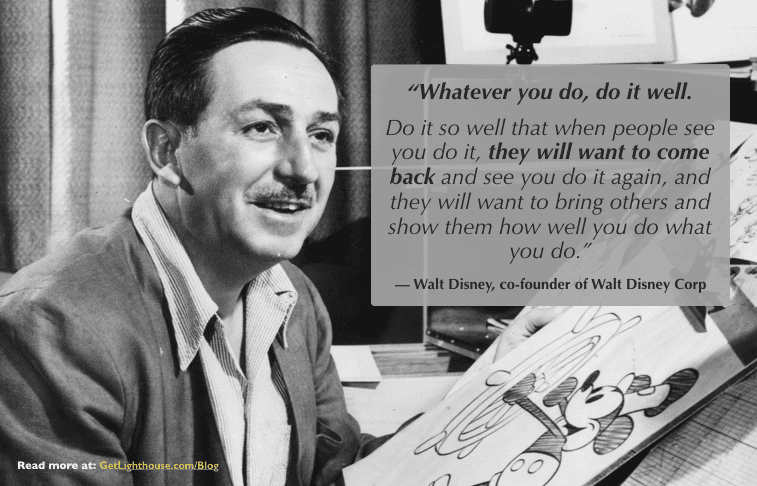 Walt Disney may be referring to his Oscar-winning cartoons in his quote, but it also applies to you and your team members you have skip level 1 on 1s with. Done well, you’ll help build a healthy organization they love working for and will tell their friends about. They’ll also start to look forward to their skip level meetings with you. These meetings are about the health of your organization. People leave managers, not companies, so if you don’t build a relationship with everyone, you can lose large parts of your department because of a bad manager. Too often, people have the mindset, “If I had a problem with my boss here, I’d probably just leave the company.” This happens when they feel they have no avenue to address problems with their manager. While there are many things to discuss in your skip level 1 on 1 meetings, this is one of the biggest. This default mindset to give up if you have a bad manager only changes if you do something about it. A little rapport goes a long way. Think about how much easier conversations are with strangers you meet once you find you share a hometown, common interest, kids the same age, past city you lived in, etc. The same applies at work. Your first skip level 1 on 1 can be a little awkward, so take some time to build rapport with them. If you can find out some things about them from their manager, all the better, but the key is to demonstrate you care about them as an individual. Everyone has a few things they care about most, and they appreciate you taking a few minutes to ask about them. Not sure where to start? Worried an age difference could make this hard? Here’s 81 ideas for building rapport with anyone. One of the most important parts of building great skip level relationships is trust. If you have built rapport and trust with them, then they’ll be much more likely to come to you with problems and ideas. Fix problems when they’re small: Catching an issue while a skip level perceives it is much less expensive than when it boils over to reach you 2 layers higher in your organization. Retain your teams: As mentioned earlier, without an avenue to give feedback on their manager, many people will just leave. Getting feedback on their manager is a great way to help the manager improve and avoid costly turnover. Get ideas for improvement: Your skip level team members have a very different vantage point than you do. They can provide valuable ideas and feedback on initiatives you’re unlikely to think of yourself. What’s one thing we could improve based on how <last major project they were on> went? What’s the best part of working with <their manager>? What’s the hardest part of working with <their manager>? What do you wish <their manager> would do more of? What do you wish <their manager> would do less of? The more specific the better. Specific questions help them more easily think of something valuable. Even better, if you ask a group of skip level team members the same specific question, you can spot patterns to identify what to prioritize of what you hear. A broad, generic question won’t do that. Looking for more ideas on feedback? 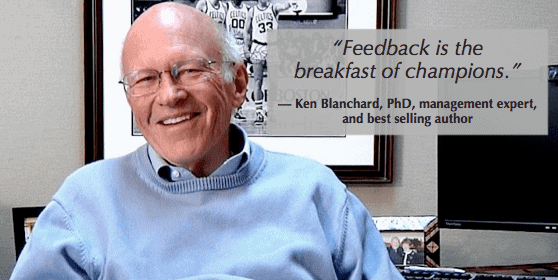 Learn about fresh approaches like feed forwards and 5 word reviews here, and make sure you build the habits to help you get more feedback here. Praise costs you nothing and has massive value. If word gets all the way to you that someone is crushing it, tell them! Nothing will put a smile on someone’s face faster than some genuine, specific praise from a leader in their organization. If you don’t don’t know which of your skip level team members are your stars, then start asking. Ask people in their skip level 1 on 1s, “who on your team is doing great work?” or “who do you enjoy working with most?” And follow up by asking why and for specific examples. This makes it easy for you to relay the good news to the great people you want to keep. “[Those answering “strongly agree to] “In the last seven days, I have received recognition or praise for doing good work” is responsible for a 10% to 20% difference in revenue and productivity. Set the example you’re an organization that values its people by making praise a part of your skip level 1 on 1s. Need to up your skills on giving praise? Here’s how to give effective, meaningful praise, and a variety of places to look to find good reasons to give praise. Especially when you start these meetings, you’ll need to have questions ready to break the ice and build trust. Over time though, many of your skip level team members will start to feel comfortable bringing things up themselves. While you may have a number of topics you’d like to cover, don’t let that block them from talking about what’s burning on their mind. 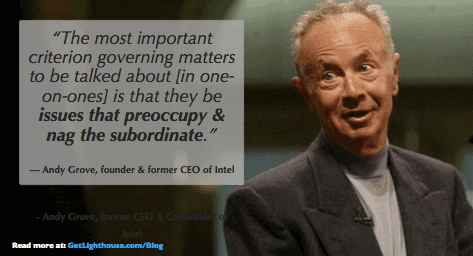 As Andy Grove knows above, you want to be sure you hear out anything bothering the team member. Regardless of how or when it comes up, use your skills of listening and observation to look for when a team member has a lot to say about something. These kinds of insights are exactly why you have these meetings and can save you from major problems later like turnover and dying projects. It’s a simple act, but it means so much. When they tell you something and you demonstrate you care enough to make a note, it shows you value their input. Also, as Grove astutely reminds us, it implies that what they said could lead to change or action. Taking notes builds confidence that it’s a worthwhile effort to bring things up with you. You should already know this from your 1 on 1s with your team, or start doing it there, too. If you’re looking to improve your note-taking skills, this post can give you a variety of ideas and tactics to try to make it easier, including my favorite: the Last 5 Minutes Method. If you made it to the level of leading other managers, this should be pretty obvious, but it’s worth reinforcing. These meetings will not be valuable conversations for long if people feel like nothing happens after you talk. Take action. What they will do: Whether it’s sending you some information, doing their part to help address an issue, or acting on your advice, it’s important they’re owning part of the outcomes. What you will do: What you discuss may be about fixing problems, sharing information, or implementing good suggestions. By making it clear what you will do, you build their confidence in coming to you again later. To discuss with their manager: A big part of a good skip level 1 on 1 is getting feedback directly or indirectly about their manager. Making it clear you will address their concerns can help with especially critical moments when a manager is doing poorly and the team is considering quitting. There will be times where you hear things that are better dealt with by their manager. Or, you may want to know what their manager has or has not already done about it. Their answer reveals all kinds of valuable insights; maybe they hadn’t thought to, the manager took a surprising action, or maybe they were afraid to. You want them to know they can come to you, but also that their manager should be their first call. If they’re not, that’s worth understanding why and addressing. Then, you can coach their manager on either building more trust or helping them behind the scenes to address the issue. This gets you working from both sides to get them talking more. That’s great coaching. Want help organizing all these notes and action items from your skip level 1 on 1s? 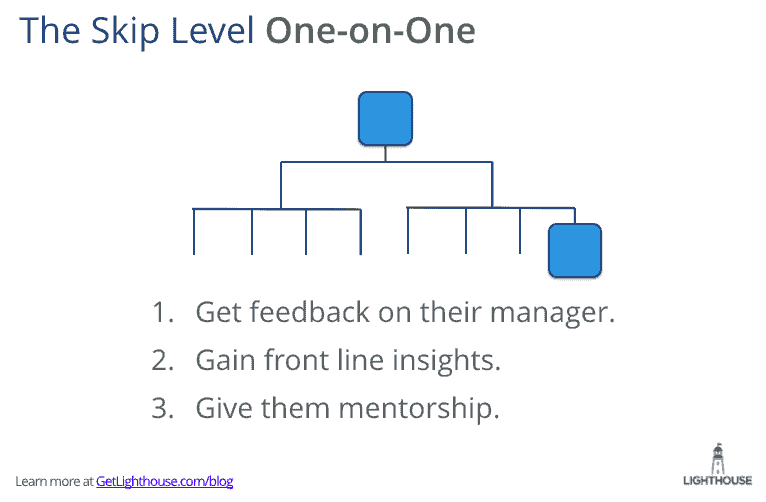 Lighthouse is purpose built to help managers like you succeed, and we’ve built a feature specifically for awesome skip level 1 on 1 meetings. You can sign up for your free trial here and mention skip levels on the signup survey to get access. Once you start these, everyone deserves their chance to meet with you. You don’t want to miss a valued perspective, and want to avoid looking like you’re playing politics with certain people. Especially introverts may not be forceful to get on your calendar, which is why it’s important to make sure you don’t miss anyone. Otherwise, they can feel slighted or not valued as much as others you did meet with. Remember: this is a recurring set of meetings, not an open door policy. Open door policies do not work. (and if you doubt this fact, then here’s 2,000+ words why). When you break it down, a seemingly daunting task can seem much easier. While you cannot meet with your skip level team members every week, with a little planning and preparation, you can keep in touch with everyone at least a few times a year. The insights you gain from them will help you improve all your managers, boost retention and loyalty, and increase the overall health of your organization. What else can you do that has that much of a positive impact? 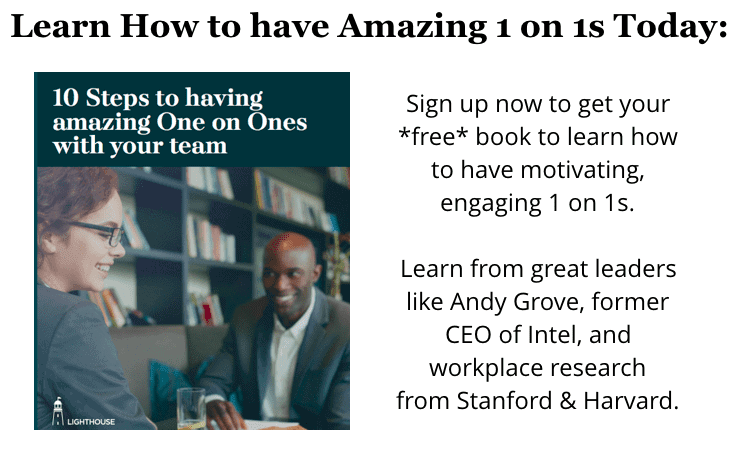 Ready to start skip level 1 on 1 meetings at your company? Need help making the most of the ones you already have? Be more organized: Keep all your notes for your 1 on1s and skip level 1 on 1s in one easy to navigate place, not 500 Google docs. Be prepared: Never forget what happened last time with prep messages, and be ready with our Suggested Questions to spark discussion. Never forget a good thought: Add notes where you already are: email, Slack, web, and mobile. Save time doing the right things: Automatically route action items from a skip level to the next 1 on 1 with their manager to discuss it. …and much more. Sign up for your free trial now here and start building the a great communication architecture in your organization.